Tame Frizz, Soften & Smooth Hair, Increase Manageability, & Improve Hair Condition Over Time. 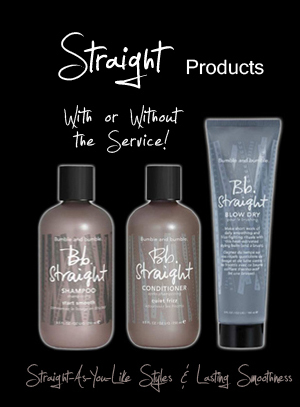 With CONCEN-Straight Technology in every product, the Straight line helps make fast work of straight, smooth styles. Together, the shampoo, conditioner, and Straight Blow Dry will reduce frizz, increase manageability, and provide softer, and smoother hair. The Straight line features a very rare gemstone blend that loosens hair’s natural curves – just add heat. It’s part of Bumble’s new breakthrough smoothing technology that improves hair condition over time for lasting softness and increased manageability. Used with virtually any Brazilian Keratin / Hair Smoothing Treatment , Straight products will not only maintain your results, They will extend the life of your treatment. For clients who do not want to commit to the investment and results of a long lasting professional treatment; Straight Shampoo, Conditioner, and Blow Dry are the only at-home products available that have been clinically proven to provide some of these benefits without a professional treatment. Sodium Chloride & Sulfate-free, Straight products can be safely used to support Brazilian keratin treatments, Brazilian Blowouts, Japanese straighteners, and all other smoothing treatments. This sodium-chloride-free, sulfate-free cleanser starts hair smooth, reduces frizz and makes hair more manageable out of the shower. When: Whenever you wash, followed by Straight Conditioner. How: Wet hair, lather well and rinse thoroughly. Follow with Straight Conditioner. A light yet thorough conditioner helps manage unruly types, calm curls and quiet frizz for smoother, silkier texture. Adds shine and encourages body and movement. When: Whenever you wash, after using Straight Shampoo. How: After cleansing with Straight Shampoo, smooth evenly through hair and let sit a minute or two. Rinse. Follow with Straight Blow Dry for smooth heat-styling. A lightweight, heat-activated styling balm makes short work of smoothing and straightening rituals, leaving hair soft, sleek and healthy-looking – not to mention more and more manageable with every use. What are the key benefits of Straight Shampoo and Conditioner? Straight Shampoo provides ultra-mild, sulfate-free cleansing. Straight Conditioner is a lightweight formula that moisturizes, reduces frizz and increases manageability without weighing hair down. Formulated with CONCEN-Straight Technology, they also help maintain straight styles and straightening treatments. Will Straight Shampoo and Conditioner straighten my hair? No, Straight Shampoo and Conditioner will not straighten your hair, but they will smooth hair, quiet frizz and help maintain straight styles, straightening treatments and the CONCEN-Straight Pro Smoothing Treatment. Do Straight Shampoo and Conditioner make hair more manageable and reduce frizz? Straight Shampoo’s sulfate free cleansers and key moisturizing ingredients in the lightweight Straight Conditioner, help to soften and smooth hair, reduce frizz and increase hair’s manageability right out of the shower. 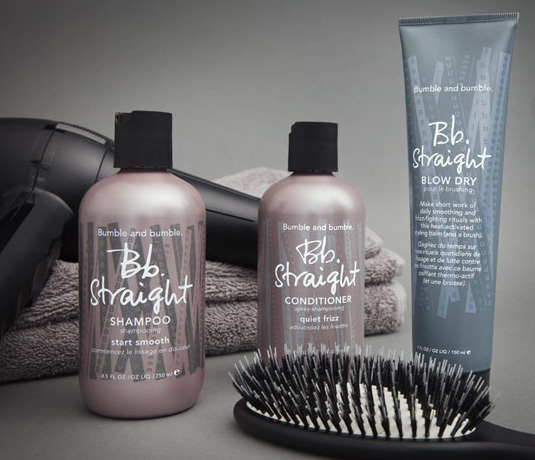 CONCEN-Straight Technology in the Bumble & bumble Straight line is clinically proven to improve hair’s condition over time, for lasting softness and increased manageability. Who should use The Straight Line? Anyone with curly, thick, coarse, frizzy, unmanageable or unruly texture looking for straight, smooth, manageable hair will enjoy the benefits of Straight Shampoo, Conditioner and Blow Dry. Is Straight Shampoo sulfate free? Yes, Straight Shampoo is sulfate-free to reassure concerned clients that they are protecting and enhancing their straightening investment with the gentlest of care. How are Straight Shampoo and Conditioner different from other Bumble & bumble. Shampoos and Conditioners? Formulated with CONCEN-Straight Technology, Straight Shampoo and Conditioner were created to help maintain the results of the CONCEN-Straight Pro Smoothing Treatment and other straightening treatments and to facilitate any straight style. Their gentle, lightweight, yet thoroughly conditioning formulas help reduce frizz and make hair more manageable for those with curly or unruly textures. How are Straight Shampoo and Conditioner different from Curl Conscious Smoothing Shampoo and Conditioner? Straight Shampoo and Conditioner were developed to help soften, smooth and reduce frizz for those who want to wear smooth, straight styles, while Curl Conscious Smoothing Shampoo and Conditioner were created to smooth and reduce frizz, while actually helping to define curls – right out of the shower. The Straight Line was also specifically developed to help maintain the results of the CONCEN-Straight Pro Smoothing Treatment. Do Straight Shampoo, Conditioner and Straight Blow Dry contain CONCEN-Straight Technology? Yes, the whole Straight Line contains CONCEN-Straight Technology. Do I have to use Straight Shampoo with Straight Conditioner? By using Straight Shampoo and Conditioner together, you will get the most optimal benefits (softness, smoothness, reduced frizz, increased manageability, improved hair condition and manageability over time) and will maximize the results of your Brazilian Keratin or smoothing treatment. Is Straight Shampoo safe to use on color or chemically treated hair? Yes, it is safe to use Straight Shampoo on color or chemically treated hair. Does the CONCEN-Straight Technology contain harsh chemicals or ingredients that may damage my hair? No, CONCEN-Straight Technology is formulated without harsh straightening ingredients. Formaldehyde free. Cysteine free. Lye free. What are the key benefits of Straight Blow Dry? Used with heat and a brush, Straight Blow Dry straightens, sleekens, polishes and reduces frizz. Without leaving hair greasy or weighed down, it provides natural lift and movement until your next shampoo. It also provides heat and humidity protection. Do I have to use Straight Blow Dry with heat tools? As the formula is heat-activated, Straight Blow Dry should be used with heat tools for best results. All you need is a blow dryer and a brush. For pin straightness, finish with a flat iron after hair is completely dry. Does Straight Blow Dry contain silicones? Yes. A lightweight silicone blend helps reduce frizz, smooth and seal the hair for soft styles with natural lift and movement. How is Straight Blow Dry different from the original Straight? Straight Blow Dry is an updated form of the original Straight. It is more lightweight and is a conditioning balm that is now appropriate for all hair types with results that last until your next shampoo. It will not leave hair greasy or weighed down. While the original Straight was unfragranced, Straight Blow Dry contains The Straight Line’s fragrance. How long will I feel the benefits of Straight Blow Dry? You will feel the benefits of Straight Blow Dry until the next time you shampoo your hair. Does Straight Blow Dry provide hold? No, Straight Blow Dry does not provide hold. For added hold and a structured style, use a structure product (like Styling Lotion or Thickening Hairspray) before using Straight Blow Dry or finish with a hairspray. What are ideal product combinations that use Straight Blow Dry? As with all Bumble & bumble styling products, starting your style with a foundation product (like Prep) evens hair’s porosity to help Straight Blow Dry perform. Any structure product (like Thickening Hairspray or Styling Lotion) works well with Straight Blow Dry to create a structured style with hold. Hair Powders extend the life of styles and add texture if desired, and Shine On Finishing Spray adds lightweight shine to finish any straight, smooth style.